BULLETIN: As of this morning Courtney Clawson (Ohio) is leading Taylor McGowan (Pennsylvania) and Colin Hurley (Missouri) for the 2010 Hall of Fame Young Poet and Euleta Usrey (Missouri) is leading Mary Nida Smith (Arkansas) for the 2010 Hall of Fame Poet. Polls close Friday night at 10:00 CST. ANNOUNCEMENT: I’m pleased to tell you that Kim Piddington, who teaches fifth grade at Wilson’s Creek School in Springfield, Missouri, was high bidder on the Plum Creek Children’s Literacy Festival chance to be featured on my blog. Kim will appear soon. We’re working on it now. And she has a great story to tell! Be watching for Kim. Here’s the latest from our hardworking friends in England, Ralph and Lisa. I love what they’re doing. We have a sparkling new multicoloured homepage at http://www.smories.com , featuring the sunny smiles of all our readers. We now have over 300 smories on the site. Thanks to everyone’s involvement and enthusiasm, we’re building a great free resource for kids online. We think/hope this new tool will be useful for AUTHORS & TEACHERS. If you submitted a smory in September, we will let you know whether it has been accepted for filming and shortlisted for the competition on 07 October. As ever, please give us your feedback. The site is growing all the time and we very much appreciate hearing your thoughts. P.S. Here’s another announcement that just arrived. Just to let you know, today we are launching a new children’s writing competition, i.e. for stories written by children. US$ 1,000 in in prizes to be won. Prize money goes to the winners’ school libraries. Submisions are now open. Competition closes 30 November. Writers must be 16 or under. If you could help us spread the word by passing this on to teachers or kids you know, that would be massively appreciated! ANNOUNCEMENT: From time to time I bring you updates from Ralph and Laura at Smories. So now I’m delighted to present a success story from one of our readers, Kara Kramer. Congratulations Kara! Read Kara’s note and consider getting busy! Today we get a visitor all the way from Spain. None other than Sylvia Vardell is checking in to let us know what she has been up to lately. Her report is fascinating. Read on! Thanks for your sweet offer– and sorry to be so slow in responding. 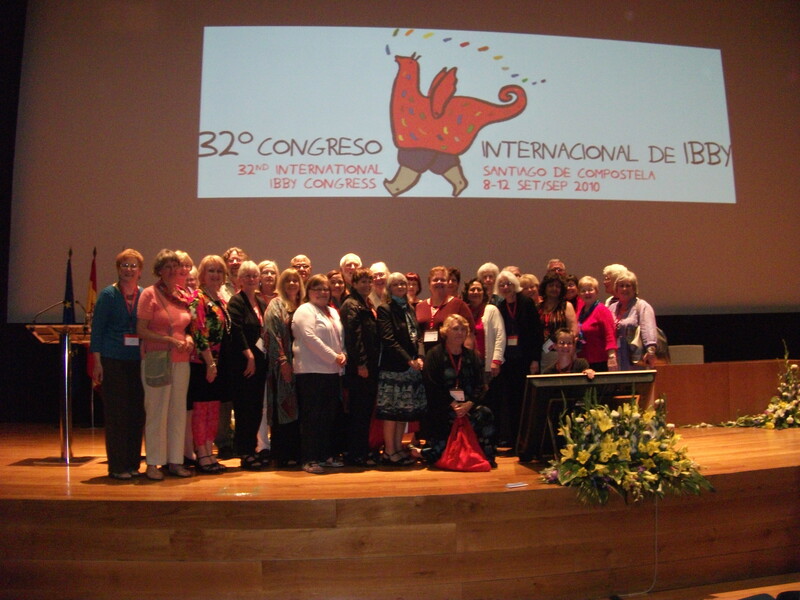 I am in Spain following the IBBY Congress here and checking emails slightly less frequently.I’m honored to be included and have attached two photos of me in Spain, FYI. One is a photo of many (most) of the U.S. members who attended the Congress (with me in pink tights, 3rd from left). 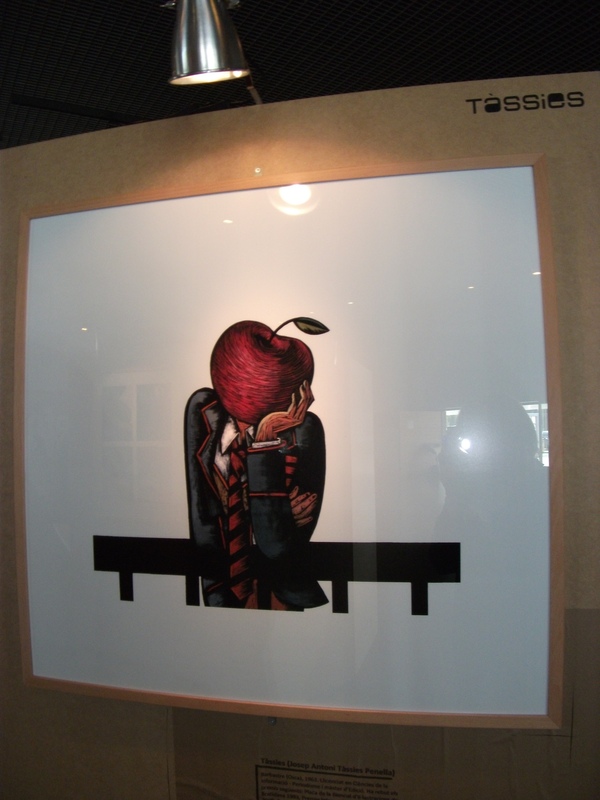 The other is from an exhibition of prominent children’s book illustrators of Spain– this one featuring Tassies who was highlighted in the July issue of BOOKBIRD, the journal I co-edit and my reason for attending the Congress. IBBY– the International Board on Books for Young People includes 72 nations around the world who all work for promoting books and reading among children. It’s a terrific group and the US section (USBBY) is an active member. We (USBBY) also hold biennial conferences, the next one is set for Fresno, California in October, 2011. Being part of this group (the US and the global) has taught me so much about the world picture of children’s literature and editing the organization’s journal has been a labor of love. I’ve also been able to infuse a bit of poetry into the journal and we feature a poem as the last page of each issue– by a wide-ranging variety of poets from around the world. In the October issue, the poem is “Família Poliglota/Multilingual Family” in both Portuguese and English written by Bartolomeu Campos de Queiros, a finalist for the 2010 Hans Christian Andersen Author Award with approximately 50 works of prose and poetry for children and young adults to his credit. More studies have been published about his work than about any other Brazilian author of children’s literature. See how much I’m learning?! Our global poetry world is fascinating! By davidlharrison  Posted in Smories, Sylvia Vardell, What Are the Pros Up To?  Tagged Smories, Sylvia Vardell, What Are the Pros Up To? Hi everyone. I hope you’ve had a good week. I’m delighted to report that Jana Smith and her able crew of student poets have returned to us! Please check the box under W.O.M Young Poets to appreciate these students and their work. Yesterday we managed to get our gift store (Gamble’s Gifts II) open on schedule so now maybe I can get back to paying bills, answering mail, and writing something! Below are a couple of annoucements that I hope you’ll find interesting. Our friends at Smories are back with an update and a new report is posted from South Wales. Read on. Subject: Smories Update – our Competition is Back! COMPETITIONS ARE BACK! $1,000 in prize money to be won EACH MONTH. All new smories added to the site will have “read-along” subtitles. If you submitted a smory in August, we will let you know whether it has been accepted for filming and shortlisted for the competition in the next 5 days. Now this from Carrie Oakley in South Wales. Everyone can use reminders of books to add to their reading list. We just posted an article, “30 Best Book Engines to Find Your Perfect Summer Read”( http://www.onlinecolleges.org/30-best-book-engines-to-find-your-perfect-summer-read/ ) . I thought I’d bring it to your attention in case you think your readers would find it interesting. Greetings from Branson,It’s always a pleasure to hear from Ralph and Lisa and learn their latest news about the smories project. Here’s a note that arrived this past Sunday. If you haven’t checked their site, you’re missing a lot of fun and an opportunity to see and hear children read your story. We have relaunched the site, now with a search filter and keyword search on the homepage. The aim is to make it easier for you to find the smories you want. There are currently 165 smories up there. See http://www.smories.com . We have added a “submit a filmed smory” tool. This lets you submit your own film, which will be hosted privately on the site. e.g. students can narrate their own stories, and we can host them in a secure environment on the smories site. The link is http://www.smories.com/submit/video/ . This is going to be significantly expanded in coming months as a literacy tool, allowing teachers to build their own smories micro-sites, in a safe, secure environment. BULLETIN: Some very itchy poems are beginning to come in. Read what’s posted and add your own versions. And if you know any young poets out there who might like to itch along with the rest of us, TELL THEM! Again, my thanks to Carol-Ann Hoyte, yesterday’s Guest Reader, for her delightful poem for two voices. Not only that, Carol-Ann spread the word about my summer program to two friends — Wendy Singer and Nancy Gow — who promptly joined the fun by sending me their own poems and pictures. Both poets will be posted this month. Who else is ready? Let me hear from you! Our friends, Ralph and Lisa are back with more excellent news about their smories project. Watching and hearing the youngsters reading winning stories is such a treat. I hope many of you have already sent something to Ralph and Lisa or are getting ready to. Here’s their update. We are trying to make the site a better showcase for writers, so we’re adding new bespoke author pages in coming days. Any smory that appears on the site will have an link to a separate author page with its own unique address, which hopefully will help raise your profile (if you wish to do this). If one of your smories already appears on the site, by all means email us a photo and any additional information if you’d like to boost the content on your existing bio. The format of the site will change on 01 August when we launch our SMORY OF THE DAY. We will have a tool on the homepage which will allow viewers to filter the stories by age/genre etc. The aim of our site is to create a non-threatening new opportunity for writers, and a great safe destination for kids. We’d love for you to continue submitting your stories, and to keep watching.